Nashville, Tenn. (February 17, 2012) – Nashville Predators President of Hockey Operations/General Manager David Poile announced today that the club has acquired veteran defenseman Hal Gill and a conditional fifth-round pick in the 2013 Entry Draft from Montreal in exchange for a second-round pick in the 2012 Entry Draft and forwards Blake Geoffrion and Robert Slaney. He is expected to meet the team today in Detroit. Gill, 36 (4/6/75), has suited up for 1,047 regular-season games (36g-143a-179pts, 940 PIMs) and 105 playoff contests (0g-6a-6pts, 68 PIMs) since 1997-98 – more than any player currently on the Predators roster. 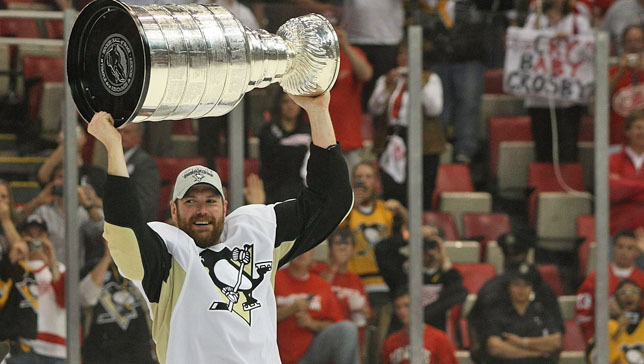 He appeared in back-to-back Stanley Cup Finals in 2008 and 2009 with Pittsburgh, winning the Cup in 2009. One of the League’s tallest players at 6-7, 240 pounds, Gill has eight points (1g-7a) and 29 penalty minutes thus far in 2011-12 playing in his third season with the Canadiens. The Concord, Mass., native was drafted 207th overall (eighth round) by Boston in the 1993 Entry Draft, and played eight seasons with the Bruins (1997-2006) before stints in Toronto and (2006-08) Pittsburgh (2007-09). The Predators now have eight draft picks for the 2012 NHL Entry Draft to be held June 22-23, 2012 at Consol Energy Center in Pittsburgh, Pa. – their own picks in the first, and fourth through seventh rounds, in addition Toronto’s third-round pick, Phoenix’s fourth rounder and the New York Rangers’ sixth-round selection. This Sunday and Monday, the Nashville Predators and Bridgestone Arena are hosting a President’s Day Super Sale, offering discounts of up to 50 percent for several upcoming Nashville Predators home games, Bridgestone Arena events and parking. This two-day, limited inventory super sale starts this Sunday, Feb. 19 at 6 p.m. and runs through Monday, Feb. 20 at 5 p.m. To take advantage of this opportunity, call 615-770-7800, go online to nashvillepredators.com/president or visit the Bridgestone Arena Box Office.